This card was so fun to make, although it did take longer than many of my usual cards. I was trying all kinds of things with my new Wonderful Romance stamp set and coordinating Wonderful Floral Framelits Dies. And of course, the Floral Romance Specialty Designer Series Paper goes right along with the stamps and framelits! The beautiful and easy-to-tie Petal Pink Variegated Ribbon makes a perfect bow. I used the ribbon to "tie" the bouquet together. I added those sweet little Gingham Gala Adhesive-backed Sequins to the middle of the stamped flowers. The leaves are cut using the die set and I added some sparkle by brushing on Wink of Stella. I tucked one tiny sprig cut from vellum into the bouquet. I hope you liked looking at my creation today! Don't forget to leave me a comment. I love to read each one. Sign up to receive my blog post updates straight into your mailbox. 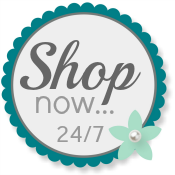 Use my Online Store to purchase your Stampin' Up! products. Don't forget that during Sale-A-Bration you qualify for free products for each $5o purchase before shipping and tax. Gorgeous - just love the colors you used. So elegant and feminine. Beautiful Card. This is SO beautiful Patti. It was definitely worth the time.